Mellor had a long and prolific publishing career, from 1902 until shortly before his death. His books went through many editions, and were part of collections held in libraries around the world. Mellor’s lifetime publishing achievement though was his Comprehensive Treatise on Inorganic and Theoretical Chemistry, which he wrote in 16 volumes over 20 years. In total, the set contained about 16-million words. Apart from writing, Mellor also taught at North Staffordshire Technical College, was a foundational member of the British Ceramic Society, undertook his own research mainly in ceramics technology, and set exams for students in various institutions around the world. Here are some of Mellor’s notes for a new edition of Modern Inorganic Chemistry, first published in 1912. 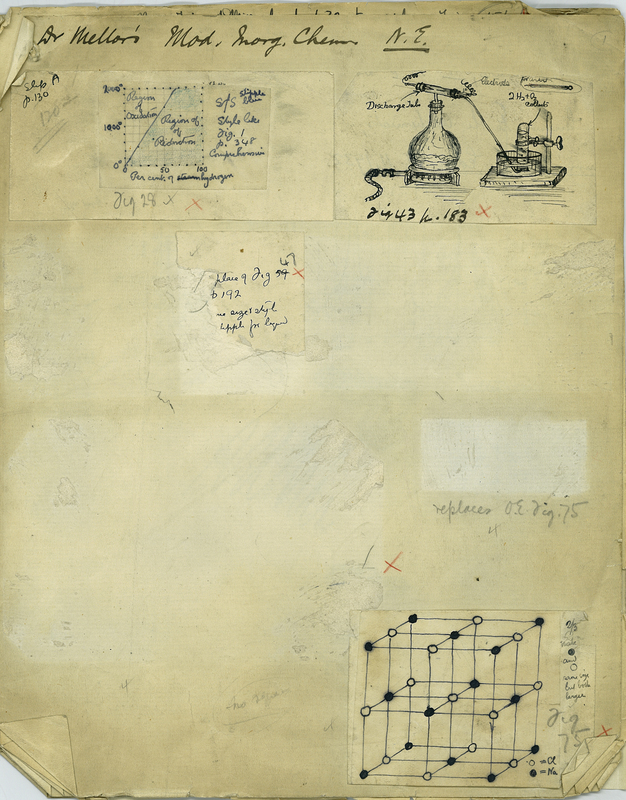 Joseph Mellor, “‘Hand-drawn Images for Modern Inorganic Chemistry. New Edition.’ ,” ourheritage.ac.nz | OUR Heritage, accessed April 22, 2019, http://otago.ourheritage.ac.nz/items/show/11222.